When I was at school, my rugby coaches taught me how play the game. They taught me how to tackle, avoid getting tackled, scrum and maul. In hindsight, they must have been rubbish because I hashed all four of those disciplines! At varsity, our coaches were more administrative in nature. They made sure we had a full squad, organised practices, ensured we had clean kit and ran fines meetings. It made sense to me, since I was already meant to know how to tackle, avoid getting tackled, scrum and maul. The question I often used to ask myself is what role a professional coach plays within a team. The players already know rugby. They eat, sleep and breathe rugby. What is a coach’s role within a team full of superstars? What then separates a good coach from a great coach? What makes Graham Henry Graham Henry and Jake White Jake White? How could Robbie Deans be so successful with the Crusaders, yet so awful with the Wallabies? I reckon there are a number of elements, far too many to explore here. But some, I think, are more prominent than others and have a more visible effect. Great coaches are organisers. Coaching, as with rugby, is a team sport. The best head coaches are those willing to admit that their specialist assistant coaches know their field of coaching best and allow them to run those facets within the greater plan. Graham Henry achieved success off the back of Wayne Smith and Steve Hansen, arguably the best backline and forwards coaches in world rugby. 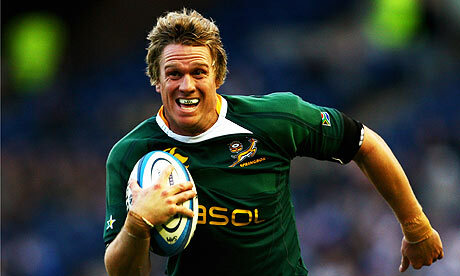 The Boks won the 2007 World Cup largely due to Jake’s appointment of Gert Smal as our forwards coach. A head coach develops a game plan, but it’s up to the assistant coaches he appoints to make it work within the various elements of a match. Great coaches can spot talent. Talent in this regard can be on-field or off-field, provided it benefits the team. A single player’s influence can lift an entire team’s performance. Think of Percy’s influence on the Boks after Jake recalled him from the doldrums of European rugby. He was a classy goal-kicker, no doubt, and solid in defence, but he was no magic man. Goal kicking aside, he was far closer in style to Zane Kirchner than Willie Le Roux – and yet he’s a Springbok hero. His all-round influence on the team was his real talent – a talent that Jake spotted. Great coaches select great captains. The bromance to top all bromances: Ted and Richie, Jake and Smitty, Woodward and Johnson. The coach/captain combination is massive. Both need to trust each other’s vision and decision-making without hesitation. They need to act in unison, to echo each other. Robbie Deans had a number of captains during his tenure as Wallaby coach. They were all solid players in their own right, but somehow you just never got the feeling that coach and captain were reading off the same page. Great coaches motivate. Great coaches get the buy-in from their players. Unadulterated, unwavering support and belief that the right choices are being made by the right people. This is largely why “the All Black way” and “the Springbok way” (to poach a phrase from the Aussies) have both won, and will continue to win, World Cups, despite being so vastly different. Sure, there are plenty of other variables at stake, but a team’s belief in their squad, their coach and their game plan (irrespective of the type of game plan) goes a long way toward achieving success. So, where does that leave us two years out from the World Cup? How many boxes has Heyneke Meyer ticked so far and where does he need to shape up? The Bok coaching team is good, but not great. Much of the Bulls forwards’ success can be attributed to Johann van Graan, although Ricardo Laubscher is yet to really prove himself a world class backline coach. However, with Rassie’s technical input and the recent appointment of a breakdown specialist from Europe, he could be developing a strong coaching unit. Could the return of Fouie du Preez be Meyer’s masterstroke? Time will tell, but it sure looks positive. Du Preez influence on the payers around him is massive, there’s no doubt about it. The Meyer/ De Villiers partnership is growing in stature with every game. Strange to think, seeing as Meyer’s blood is blue and only blue and de Villiers lives and dies for Province, but they really are starting to dove-tail superbly. If de Villiers can hold his form through to 2015, he will be the key to our success. If the first three boxes appear to be ticked in pencil, the belief box looks to be ticked in permanent marker. If you listen to any player interview, it seems clear that the team is tight. They believe in their coach and his game plan. They believe it is going to win them the World Cup in two years’ time. They’ll put their bodies on the line for Heyneke because they can see what their achievements mean to him in press conferences, coaching boxes and interviews. If nothing else, he has the belief of his squad, which is probably the toughest of all the boxes to tick.